On June Pearce's 84th birthday, a Craigslist ad placed by her daughter, Carol Brown, gave her the chance to relive one of her happiest memories; taking a quick ride on the back of a motorcycle. Brown came up with the idea after recalling her mother's tales of riding on the back of an old boyfriend's motorcycle in the 1930's. "It was during the Depression," Brown says. "Not a lot of excitement happened then." Pearce often recalled the ride, noting that it was one of the most exciting events of her life. Pearce, who is currently battling lung cancer, was stunned when her daughter told her about the Craigslist ad, which asked readers to "Come Give Granny A Ride On Your Hog." 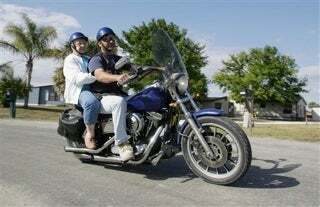 The ad asked local bikers to consider giving a nice old lady a ride on the back of their bikes for her 84th birthday. A man named Ron Borowski answered the ad, touched by the sentiment. "My mom passed away from cancer, so the ad touched me," said Borowski, "I just figured it would be an adventure." Pearce was given notice of the ride a day before her birthday; she told all of her friends about the adventure and headed out to the driveway to wait for her ride, which arrived at 4pm. At first, she hesitated to get on the bike, but Borowski convinced her, and off they went, with Pearce's husband and daughter watching, taking two loops around the neighborhood before returning to Pearce's home. According to the AP, "Pearce wore a tiny smile as they rumbled into the driveway."